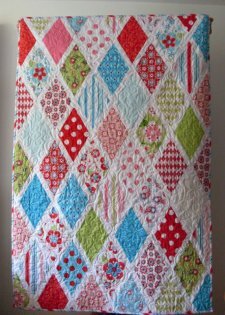 "This small quilt measures 33 x 39 inches (80 x 96cm) and is perfect for that little cuddly baby you want to keep warm - but you can also just make it bigger by adding more diamonds to the sides if you prefer. "And don’t be afraid of those diamonds, I show you that you absolutely have nothing to fear, we just have to use a bit more pins than we usually do." 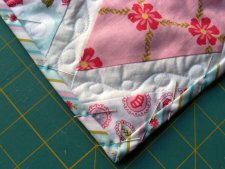 Also be sure to check out the tutorial page where you'll find many other excellent projects, including a Sweet Divinity pillow!